Maths is overkill for this setup I think (is it? ), but what alternative(s) come(s) closest in terms of depth of possibilities and is small enough to fit in a 4ms pod? 2hp EG times two comes to mind. Add to that LFO, Mix, VCA as needed. All of that in half the rack space of a single Maths. Thanks, best is probably to just start with anything and go from there. 60 hp 4ms Pod: Konstant Labs power checker, then a Bastl Hendrickson for an input, which allows you to crossfade with the output on the module. This means that you can use the Hendrickson's 1/4" output as a "clean" channel to your amp and crossfading allows you to control your wet/dry levels, either manually or via CV. An Erica PICO RND gives you a sine/pulse LFO, clock (plus clock in from an external sync), noise and random signals and one of two sample and holds, and next to that a Doepfer A-184-1 contains the other S&H, plus a ring mod and a slew limiter to 'smooth' your S&H shifts. Maths next, then I opted for an Eventide Euro DDL for massive delay flexibility, including looping, reverse delays, tap tempo (and the Euro DDL can also serve as your master clock, clocking the PICO RND) and CV over time, feedback, delay mix and an internal LPF. Following that is something very guitar-nifty, and that's a 3-band EQ with CV over frequency on each band. Coupled with the Maths, this will allow loads of timbral shifty weirdness. The CIAO! output allows you to run the EQ in either series or parallel, since it has dual stereo ins. Oh, and a headphone amp, too. Now, this doesn't exactly address things like reverb, etc for stereo operation, nor does this deal with the depth issue I mentioned...but I really intended this more as an example of what's possible in that tight a cab which you can work off of as a basis for ideas. Wow, thank you Lugia for your extremely detailed explanations and your effort! 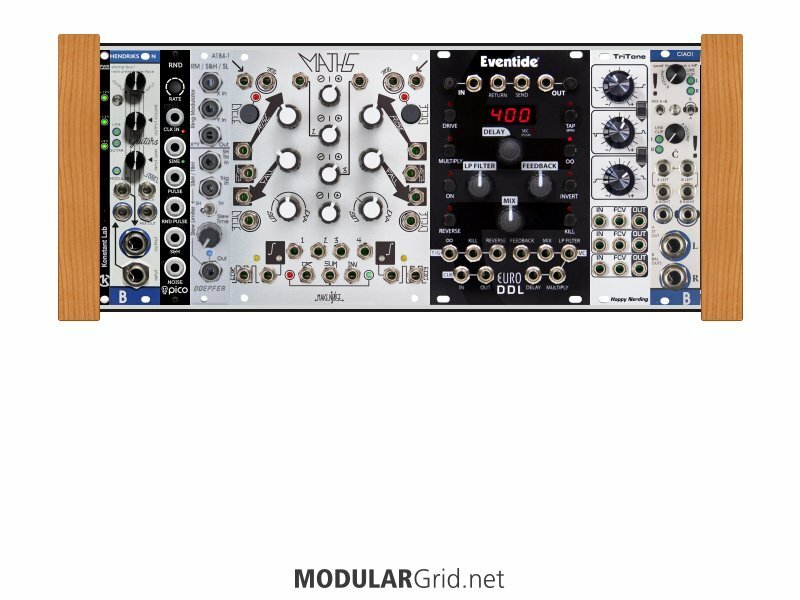 This is absolutely inspiring, it is much more than I had tested in my modular grid rack. Need to wrap my head around it now. I know that I really need stereo delay and am thinking if a more multi effect with all these mod sources, but it‘s a great start!